Labels aside, the authors work hard to move past any preconceived notions about what Calvinism really is. They resist the system as an end in itself for many good reasons. But they fully embrace (and rightly so) the biblical framework of Reformed theology; the framework which was taught by Augustine, the Protestant Reformers, and the Puritans. But these godly men merely built upon the Reformed theology which was originally taught by the prophets, apostles, and Jesus Christ himself. In this historical context, one might argue that Jesus was the most famous Calvinist! 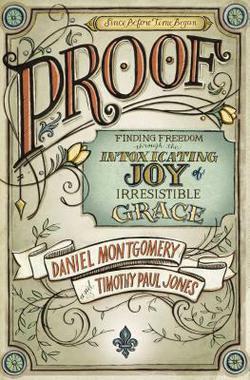 “Calvinism” the authors suggest, “for the sake of Calvinism is not worth fighting for – but grace is always worth fighting for.” So with evangelical passion and strong biblical support, Montgomery and Jones build an alternative acronym which corresponds to the famous TULIP model to accurately defend the historic doctrines of grace. “All people are conceived in sin and born children of wrath … Regeneration is a marvelous mysterious and inexpressible work, not less than or inferior power to that of creation or of the RESURRECTION of the dead. “God PRESERVES, CONTINUES, AND FINISHES this work” all to the praise of his glorious grace. Each year, I am on the lookout for theological books which accurately reflect the doctrine of grace; books which are written for the laymen in mind and spur them to deeper reflection on God’s truth. PROOF fits that bill perfectly. The authors not only hit the doctrinal mark; they do so in a winsome way which is combined with a writing style that will appeal to a wide range of people. Discover the truth of PROOF and become convinced of the grand theme of Reformed theology!